Owenburg is a member of the Suffolk County Volunteer Firemen's Association where he served as President. Jerry Owenburg has been re-elected to the Board of Trustees of the FASNY Firemen’s Home. 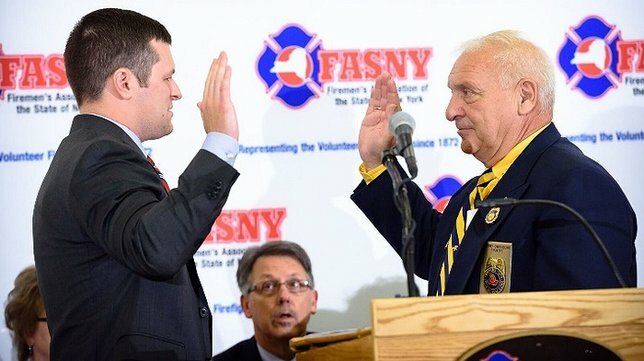 West Babylon, NY - August 24, 2018 - Jerry Owenburg, a 48-year veteran of the fire service, has been re-elected to the Board of Trustees of the Firemen's Association of the State of New York (FASNY) Firemen’s Home, a specialized residential healthcare facility for retired volunteer firefighters in Hudson, NY. Owenburg was elected at FASNY’s 146st Annual Convention in Syracuse, New York on August 12. He will continue to serve another five-year term as a Trustee. Owenburg is a member of the Suffolk County Volunteer Firemen's Association where he served as President. He is also the Past President and Treasurer of the Suffolk County Firefighter's Burn Center at Stony Brook University Hospital. In addition, he is a Director from Suffolk County to the Southern New York Firemen's Association, a member of the Suffolk County Fire Safety Educators, where he is now the voice of Sparky the Fire Dog, and is the Caregivers Coordinator for the Firefighters Cancer Support Network. Subject: LongIsland.com - Your Name sent you Article details of "Jerry Owenburg Of West Babylon Re-Elected As Trustee Of FASNY Firemen’s Home"